One of the biggest problems owners of hairless cats face is keeping them groomed since there is no fur to absorb the natural oils from the skin. Hi! My mom has two Sphynx cats. She is having a hard time keeping their skin clean. She bathes them about three times a week and it still doesn't help. Is there a special type of shampoo she could use? She loves her cats, but the greasy residue they leave on stuff is driving her crazy. I'd appreciate any help you could give. 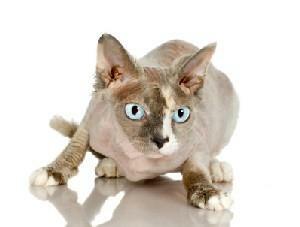 Keeping a hairless cat groomed can present a challenge. Since they do not have fur to absorb oils, their skin does tend to be oily. Most cats only need to be bathed once a week to take care of this problem, but some require more frequent bathing. Bathing three times a week sounds a little excessive. You don't mention what type of products your mother is currently using to bathe the cats. I would recommend speaking with the veterinarian about the best product to use for these cats or visiting a local pet supply store. Instead of bathing the cats so often, ask your mother to try daily grooming. Oil builds up so quickly on these cats that daily grooming is a must. She should try bathing the cats once or twice and week and then she should wipe the cats' bodies down every day with a soft cloth. A baby diaper works well for this. She should just rub the cat down basically. This will help to absorb some of the oil and will also encourage the cat to groom on its own. She might also want to give pet wipes a try. These work well as a bath substitute. Many breeders I found use baby wash because it is gentle on the cat's skin. Aveeno and Johnson's were two that were mentioned over and over again. One breeder did mention that she uses Dawn (original) on one of her overly greasy cats. However, I think with the daily grooming that the oil is going to be greatly reduced, so I would try this only as last resort. A sphynx has very sensitive skin, so tread cautiously. Also, because their skin is oily, it does pick up dust and dirt. Buying dust-free litter can help reduce how often the cats need to be bathed. I hope some of these ideas help. Tell your mom we said, "Good luck!"